In Russia of the Slavic mythos, there is a three headed dragon called Zmey Gorynych. It belongs to a type of dragons called Zmay, which are similar to European dragons, but not all zmays are malicious, as many are intelligent and well respected. In fact, many Slavic national heroes believe to have connections to dragons, most notable the legendary Vlad Tepes, whose title Dracula means “Son of the Dragon”. Aside from the heads, this beast resembled traditional European dragons with the four legs, wide wings, and tail. What makes Zmey Gorynych different from other dragons is its ability to regenerate unless you can simultaneously decapitate all three of its heads to prevent the regeneration process. Zmey Gorynych is most known for his epic battle with the Slavic folk hero Dobrynya Nikitich. It starts with the hero encountering the dragon while bathing in the Puchia River. The dragon begs for its life and the two make a nnonaggression pact. Once the pact is made, Zmey Gorynych proceeds to fly away and kidnaps a princess who is he niece of Prince Vladimir. When Dobrynya arrives to Kiev, he is tasked in rescuing her by Prince Vladimir and he ventures off to the Saracen Mountains to slay the dragon. Using a magic whip given by his mother, Dorynya travels past the mountains and fights the dragon. The battle between Dobrynya Nikitich and Zmey Gorynych goes on for three days straight. One the third day, Dobrynya feels like giving up, but a voice tells him to endure it for another three hours. After three more hours of battle, Dorynya finally kills the dragon. However, the spilled dragon’s blood did not soak into the ground and both Dobrynya and his horse were stuck in the blood for three more days. After which, the voice from above tells him to stick his spear into the ground recite an incantation and in doing so, the earth swallows up the blood and Dorynya rescues the maiden, Zabava. 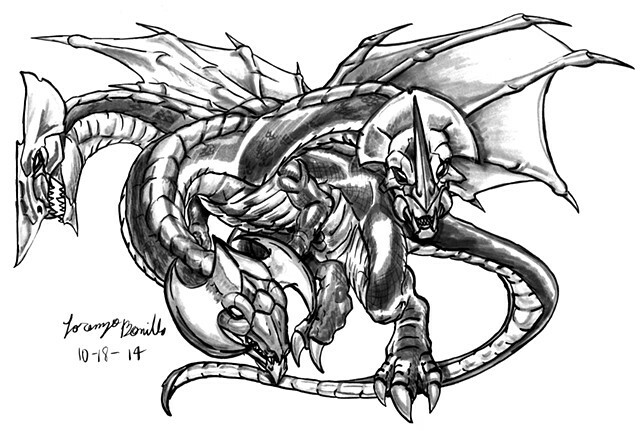 My version of Zmey Gorynych depicts the three-headed dragon with heavy scales and giving each head a different crest for a unique touch while giving its wings the Ghidorah homage touch for this massive beast.